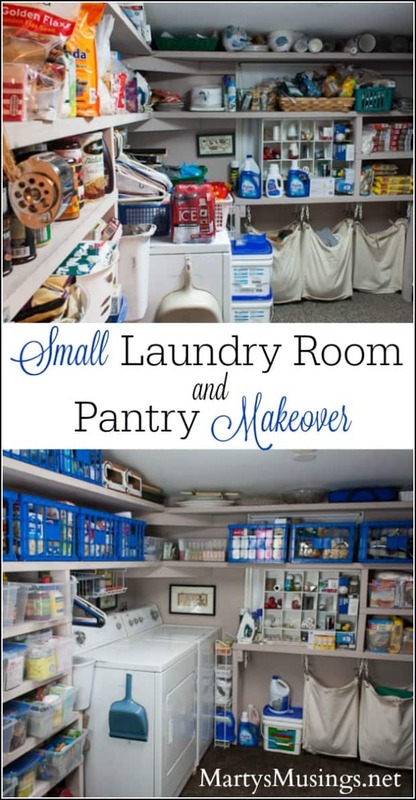 This post on Small Laundry Room Ideas has been compensated by Collective Bias, Inc. and its advertiser. All opinions are mine alone. #BIGDeal #CollectiveBias. 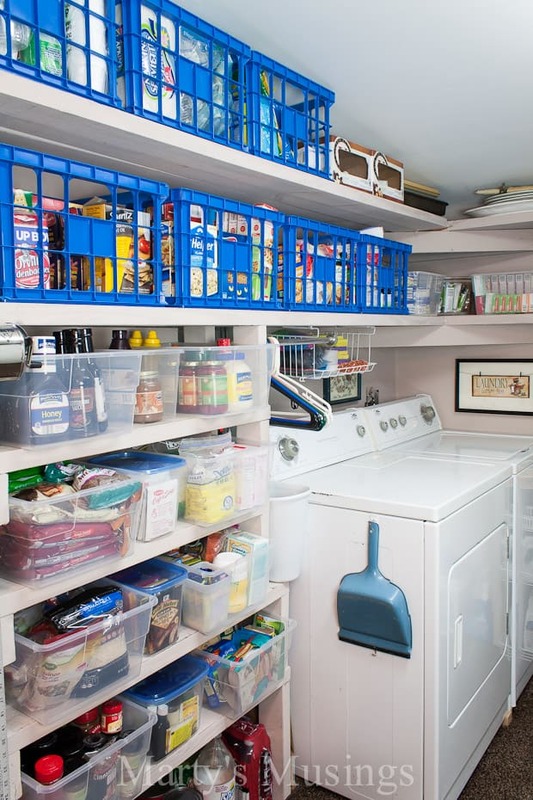 I’ve drooled over beautiful laundry rooms and pantries on Pinterest for months now. Our poor little space was just crammed full of stuff. Lots of stuff, I tell you. His stuff and her stuff. Their stuff and family stuff. Dirty clothes, pet food, tools, drinks, canned goods and enough stuff to make Let’s Make a Deal happy! I want a pretty, Better Homes and Garden room. I really do. 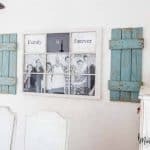 I’m a DIY blogger. We live for beautiful rooms and makeovers to die for. But sometimes a room just has to be a room. A space actually has to be lived in because no matter how pretty this room might be, if there’s no food in it my family will not be happy. If clean clothes don’t appear like magic from this room my perfect homemaker illusion will be shot down. Ok, that one got obliterated years ago but a girl can hope can’t she? Now on to the nitty gritty details. 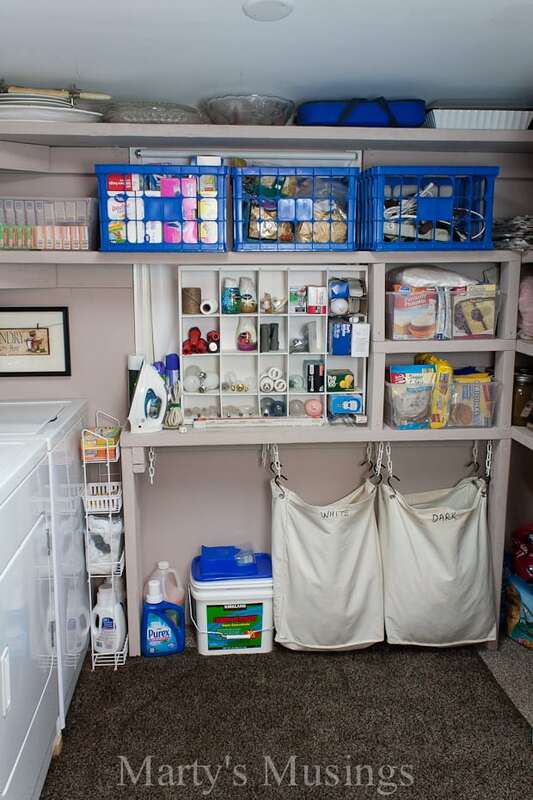 This room is part of an addition to our home so the ceiling is sloped and trying to organize the room was a challenge. 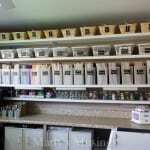 Tim would have painted for me but he was out of state and there was not enough time in the year for me to tackle painting all those shelves! Thus, I stayed with this delightful blah peachy/taupe color (don’t ask me why I picked it) and trusted Big Lots to help me turn this ho-hum room into an OCD lover’s organized dream. 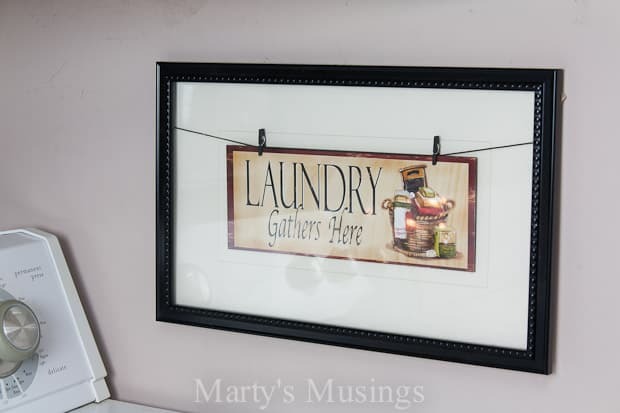 The most important important step was to measure all the shelves BEFORE I went to Big Lots to gather my laundry room ideas! 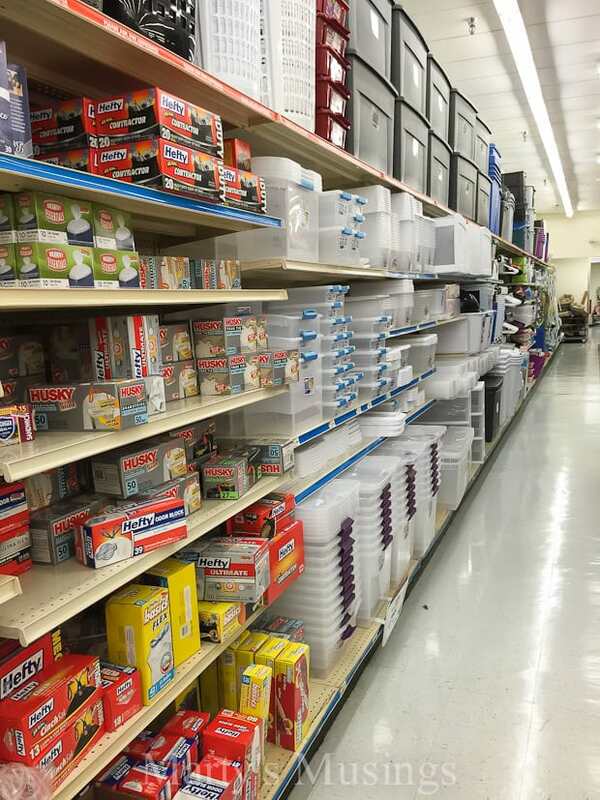 Once there I studied all the containers and picked out the ones that would best fit my needs and dimensions. 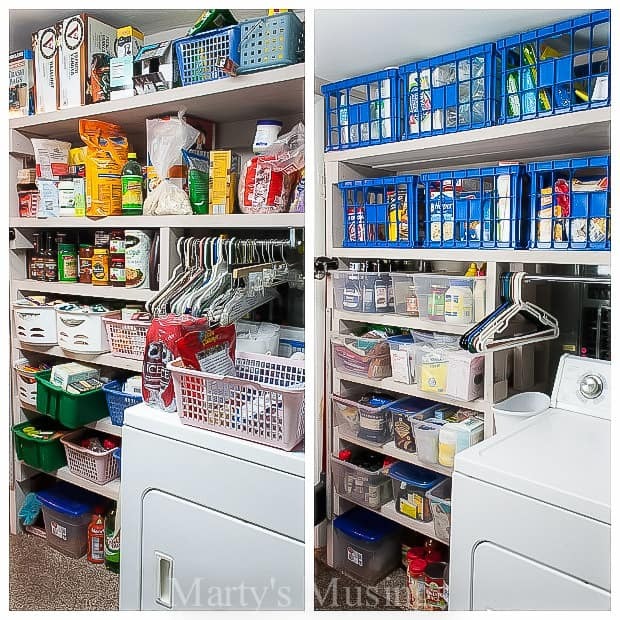 For this room I wanted the look of open storage so my family could actually find the food! Eventually I will add labels (because I can get a bit carried away!) but for now we can see where everything is located and I know Tim and Stephanie won’t starve to death when I’m gone. 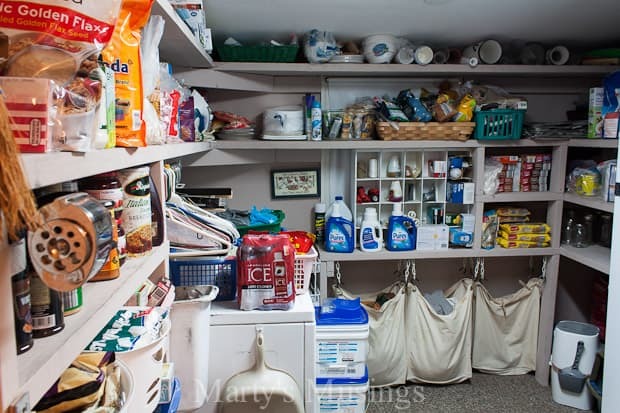 Plus there’s even a chance they’ll put the groceries away in the proper place! The best part? I only spent around $60 for the organizers! Now that’s a great deal! 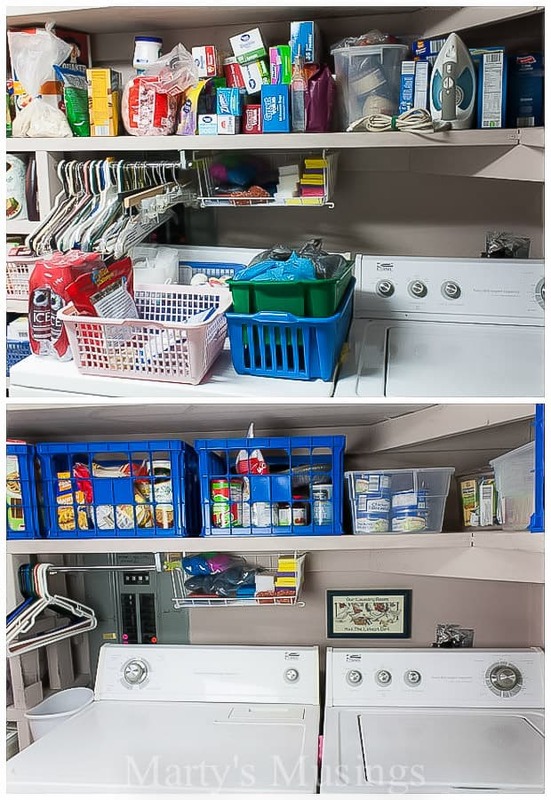 I’m going to be writing a couple more posts in the near future with my best tips for laundry and pantry organization but as far as the food, I grouped like items together such as spices, condiments and baking supplies. Our laundry room rug was shot but since we weren’t painting we didn’t want to move the appliances. This 6×8′ rug from Big Lots was perfect for the room. We just tucked it under the washer and dryer and it hides the old one perfectly. While I was at Big Lots I decided my table could use a bit of sprucing up as well. 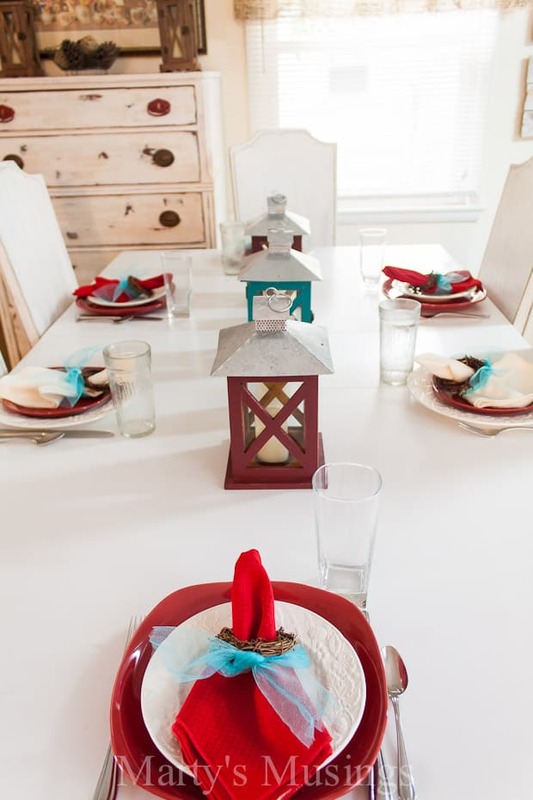 I’m changing up my colors by adding some red in with the aqua in my kitchen so I chose a set of four square red dishes for a pop of color. I mixed in these textured off white round plates that I already had, as well as unmatched glasses and napkins. 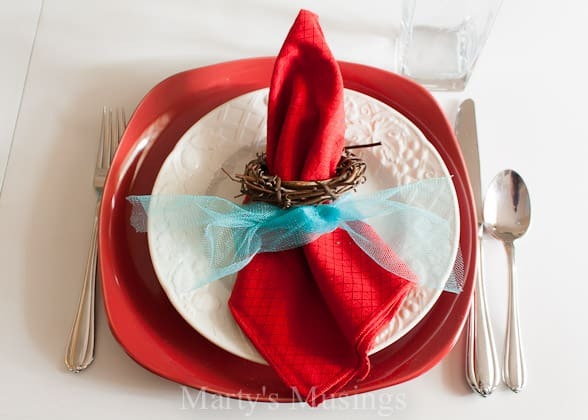 Since I love ribbon I added a bit of aqua tulle to the rustic napkin rings to bring it all together. 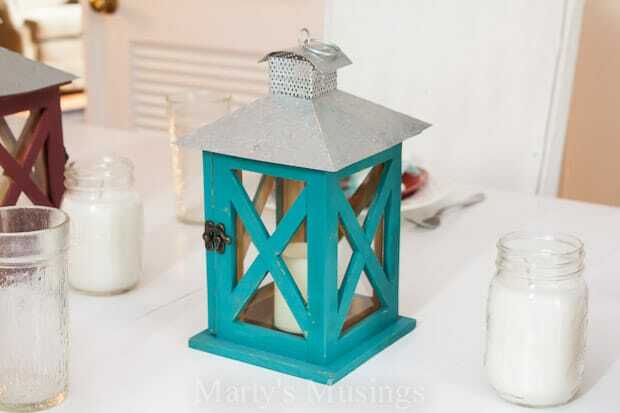 Complementing the colors are these rustic lanterns I bought for under $20 each, a great value for this trendy accessory. 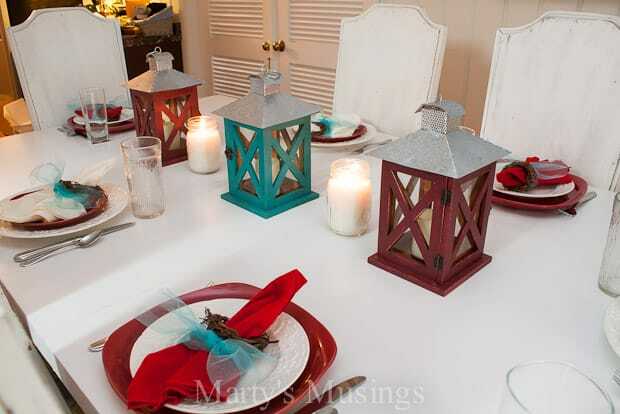 I’m such a fan of lanterns as you might remember from my fall table setting. 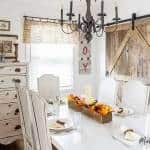 So if you’ll do me a favor and make my heart happy go ahead and pin and share this makeover for all of us who live in ordinary, lived in, loved in homes. 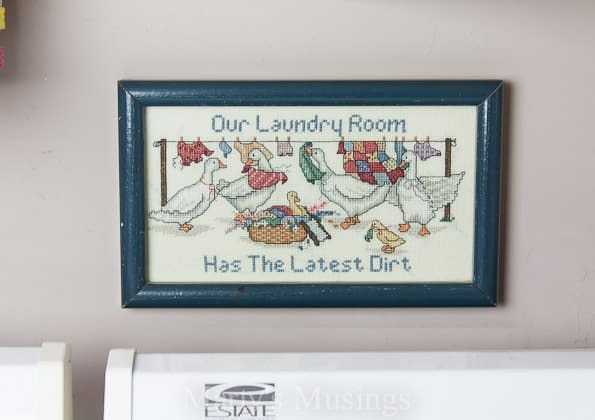 Your home will thank you! 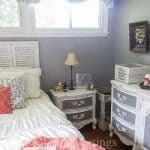 If you could makeover one room in your home which one would it be? 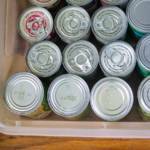 Check out these ideas to get you started! 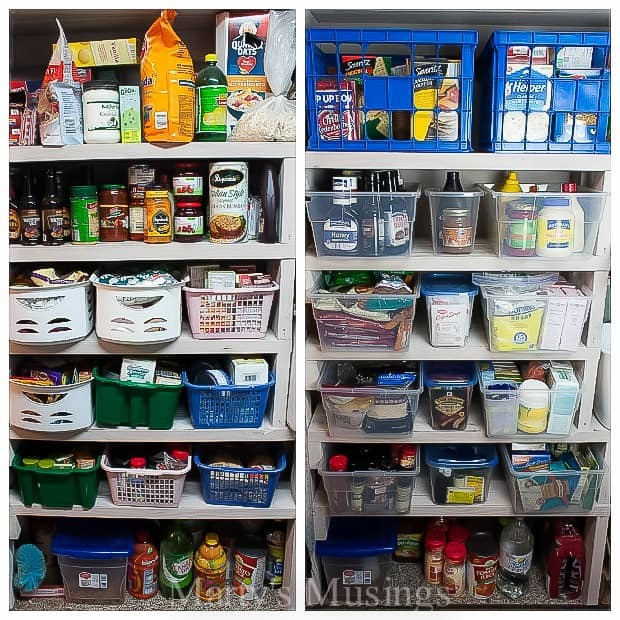 *sigh* I wish I had a pantry. This looks great, Marty!! This is awesome Marty! 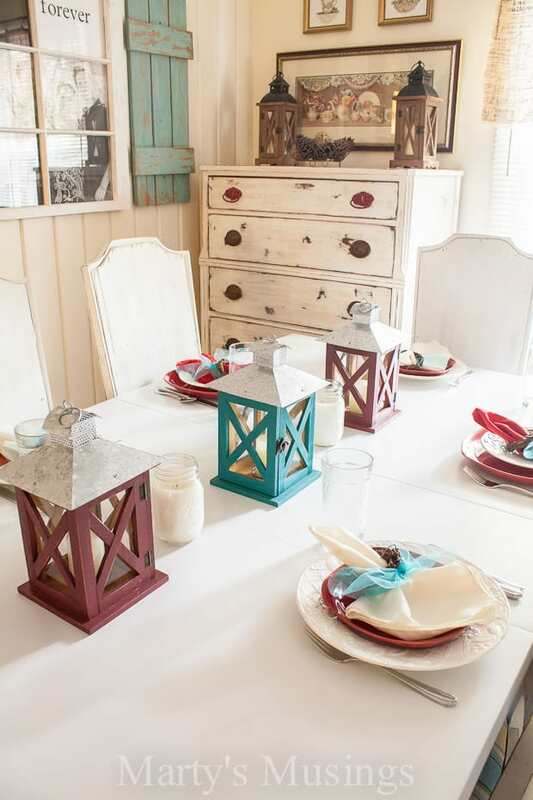 The red and white plates look perfect in your room. Going to check out the organizational ideas. I can’t believe you actually consider this a ‘small’ space. Hi, Ramey. I completely understand what you mean! It really isn’t that small for many, many people, but in order to bring readers to the blog to read the tips that’s how I market it. I guess small is really just perspective anyway. 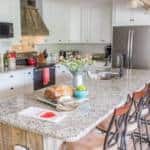 The rest of the room that you can’t see includes our freezer, water heater, tools and all sorts of not so pretty everyday life stuff!